I’m super excited to share my original recipe for Spaghetti Western Chili Casserole for this week’s #SundaySupper theme of holiday casseroles. This casserole is quick to make (30 minutes or less) and can be made in advance, which is always a plus during the busy holiday season. 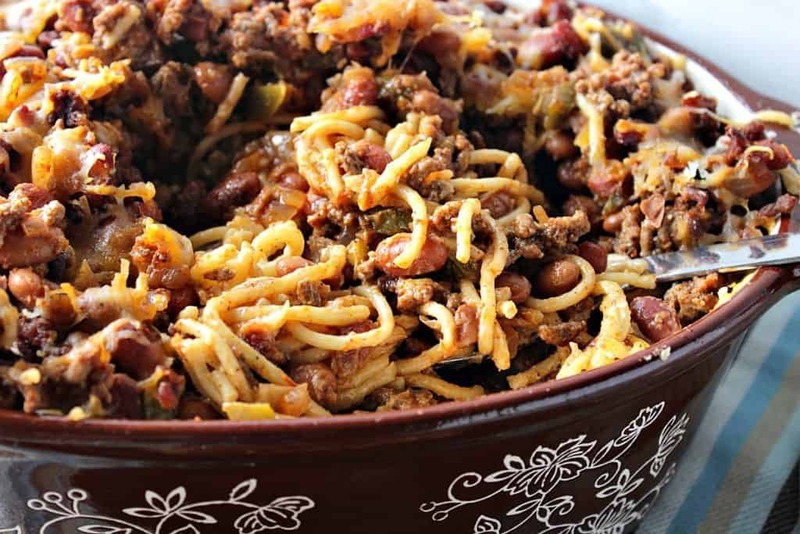 The ingredient list for Make-Ahead Spaghetti Western Chili Casserole is relatively short, sweet, and they’re all basic staple pantry and fridge items. You’ll need one pound of ground beef (ground turkey or pork may be substituted), chopped onion, garlic, spaghetti, cream cheese, one can of red beans, one can of pinto beans (or you may substitute your favorite beans), one jar of salsa, water, chili powder, smoked paprika, smoked cumin, ground coriander, salt, pepper, and shredded cheddar cheese. You can find the full printable recipe card with detailed instructions, below. Call me crazy, but I get super excited to share recipes with you guys. Especially when they’re a little unusual, a little fun, and a whole lot of tasty! 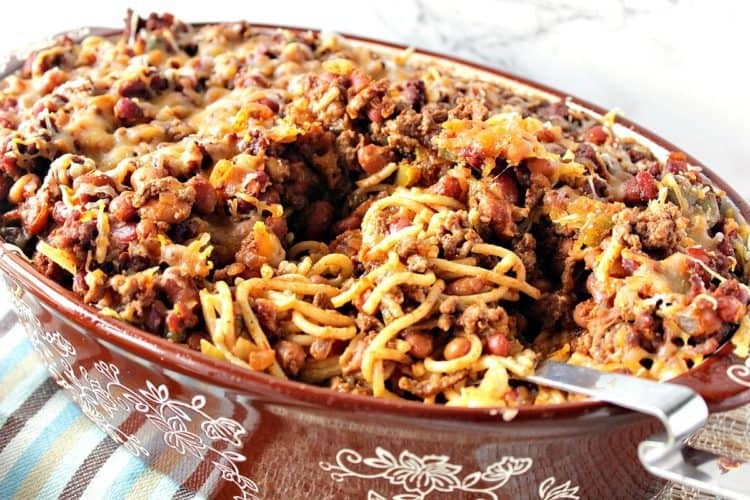 This Spaghetti Western Chili Casserole is sure to please the entire family. Its heat level is mild, but feel free to kick up the temperature by adding more chili powder, and maybe a pinch or two of chili flakes if that’s what your family prefers. In a large skillet over medium/high heat, brown the ground beef with the onions and seasonings. To the browned beef mixture add the beans, that have been drained and rinsed, and the salsa. Meanwhile, cook the spaghetti according to package directions and reserve 3/4 cup of the spaghetti cooking liquid before draining. Add one block of cream cheese to the drained spaghetti along with the reserved cooking liquid. Stir well to melt the cream cheese and completely combine the cream cheese and pasta. Add the cream cheese spaghetti into a 3-quart casserole dish that has been sprayed with cooking spray. Top the spaghetti with the ground beef and beans mixture. Bake in a preheated 350-degree oven for 20 minutes. OR cool, cover, and refrigerate (or freeze) until ready to bake. Top with shredded cheese after 20 minutes in the oven and return to the oven to melt the cheese for an addition 5 minutes. *Note – If refrigerating the Spaghetti Western Chili Casserole before baking, allow the casserole to sit at room temperature for 30 minutes before baking (without the shredded cheese). If freezing, you can bake the casserole from frozen, covered, for 60-90 minutes. Add the shredded cheese after baking and return to the oven, uncovered, to melt the cheese. Cream cheese is mixed with spaghetti for a creamy casserole base and then topped with a smoky ground beef chili before baking. In a large pot, cook the pasta 2 minutes short of the package directions. Reserve 3/4 cup of the pasta cooking water and drain the pasta. Place the hot pasta back into the hot pot and add the cream cheese and the reserved cooking water. Stir well until the cream cheese is completely melted and the spaghetti is well coated. Add the cream pasta in an even layer in a 3-quart casserole dish that has been sprayed with cooking spray. Meanwhile, in a large skillet, brown the ground beef and onion over medium/high heat. Stir in the garlic, chili powder, paprika, cumin, coriander, salt, and pepper. Cook and stir an additional 2-3 minutes. Reduce the heat to medium/low. Add the drained beans and salsa to the ground beef mixture and stir well to combine. Top the creamy spaghetti with the ground beef chili mixture in the 3-quart casserole dish. If baking immediately, bake for 20 minutes in a 350-degree oven. Top with cheese and return to the oven until the cheese is melted. If refrigerating, allow the casserole to cool slightly before covering and refrigerating. When ready to bake, allow the casserole to sit for 30 minutes at room temperature. Bake covered for 30 minutes. Top with cheese and return to the oven until the cheese is melted. If freezing, allow the casserole to cool completely, cover well and freeze for up to 2 months. When ready to bake, preheat oven to 350 degrees, cover the casserole and cook for 60-90 minutes or until cooked heated through. Uncover, top with cheese and return to the oven until the cheese is melted. 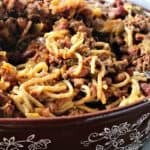 I hope you’ve enjoyed this recipe for Spaghetti Western Chili Casserole #SundaySupper ‘s Holiday Casserole Recipes theme as much as I’ve enjoyed bringing it to you. If you’re a lover of casseroles, especially ones that will save you time during the busy holiday season, please click on the titles listed below to be taken to all sorts of delicious casserole recipes shared by the #SundaySupper group of food bloggers. 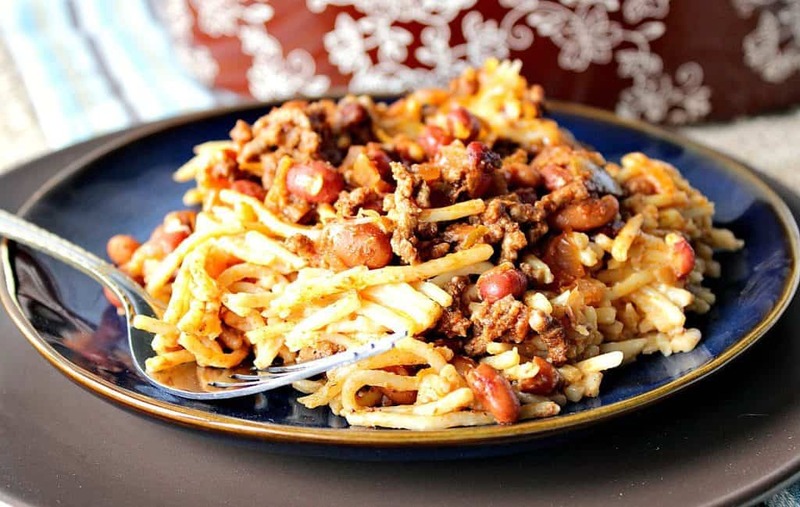 Should you have any questions about this recipe for Spaghetti Western Chili Casserole, or anything else you see on my site, please don’t hesitate to contact me directly or leave me a comment in the comment section below. It is always my pleasure to get back to you with a reply just as soon as I possibly can. This would be a perfect meal for Thanksgiving week! Easy, hearty and delicious!!! I can’t wait to make this one for the kids when they visit at Christmas. It’s going to be such a WINNER!!! What kid doesn’t love spaghetti? Thanks, Susan! 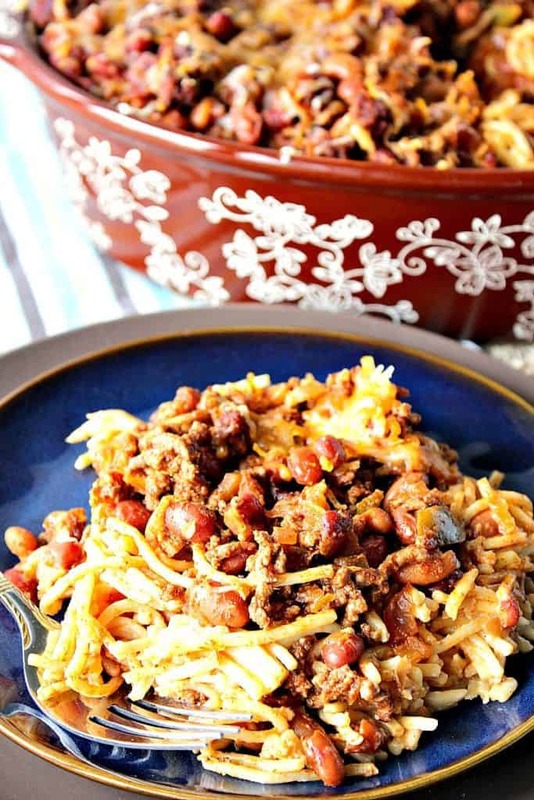 This Spaghetti Western Chili Casserole is a really nice twist on traditional baked spaghetti. Love it. You are right, this is a fund dish for the whole family to enjoy. Anything that has cream cheese, pasta, AND salsa in it is more than welcome on my table! YUMMY! Looks tasty and love that it can be made ahead. That aspect is so important during the busy holiday season.